Father Enlists to Honor Fallen Son When First Lt. Nathan Krissoff was killed in Iraq a year ago, his father, Bill, an orthopedic surgeon, searched for a way to honor his son's sacrifice. With the help of President Bush and Karl Rove, the 61-year-old enlisted in the Navy Medical Corps and hopes to be assigned to Iraq. Dr. Bill Krissoff (right) enlisted in the Navy Medical Corps as a way to honor his son, First Lt. Nathan Krissoff (second from right), who was killed in Iraq a year ago. Also pictured are Bill Krissoff's wife, Christine (second from left), and son, Lt. Austin Krissoff. When First Lt. Nathan Krissoff of Reno, Nev., was killed in Iraq a year ago, his father, Bill, an orthopedic surgeon, searched for a way to honor his son's sacrifice. The 61-year-old decided to enlist in the Navy Medical Corps in the hope of being assigned to Iraq. Krissoff is a taut, fit man who swims a mile every day. But a Navy medical recruiter told him that he was well past the enlistment age limit, and that getting an age waiver could take a year. In August, the surgeon seized an opportunity when he and his wife, Christine, were invited to meet President Bush in Reno along with the families of other fallen soldiers from the area. "He asked if there was anything he could do," Krissoff said. "I said, 'Well, there is one thing. I'd like to join the Navy Medical Corps. Is there any way you could help me with this process?' And Karl Rove was in the room and he asked me to fax my papers to him in the White House." Within days, Krissoff received a call from Navy Medical recruiter Lt. Cmdr. Ken Hopkins, who said Krissoff had been granted an age waiver and had a stack of papers to sign to become a military doctor. "When you're in a hospital, you're in an air-conditioned brick-and-mortar place. In an operational setting, he may be in a tent or in a field. So he'll be learning how to care for patients in a different way," Hopkins said. Krissoff relishes the challenge of such a dramatic midlife change. He said he doesn't see anything special about his enlistment and that he's just following the example set by his sons. 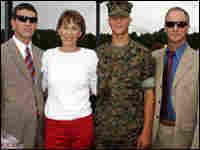 Nathan Krissoff was, by all accounts, an extraordinary young man and Marine. He was a pianist, violinist and poet, as well as captain of his high school and college swim teams. Despite his many talents, friends say that Nathan was the most humble and selfless person they had ever met and that he was always looking for opportunities to help people. 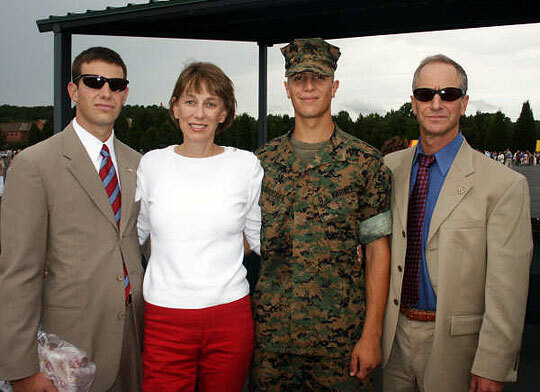 Another son, Austin, is also a Marine lieutenant stationed in Camp Pendleton, Calif.
Bill Krissoff says most people understand why he's joining the military, especially those who have lost a loved one in Iraq or Afghanistan. But he says others think he's crazy to give up a successful orthopedic practice to go to a war zone. "I tell them I'm honored and privileged the Navy Medical Corps will have me," Krissoff said. Krissoff is now a Lieutenant Commander in San Diego, where he will be for a few months. He may be sent to Africa, then perhaps to Iraq.